The pieces all seem good enough to warrant buying this film: Cronenberg and Mortensen together again (A History of Violence, Eastern Promises), a true story based on two extremely interesting men, and three excellent actors, Fassbender, Knightley, and Cassel. Sure, why not. Animated films have always had a place in the hearts of American moviegoers. Children love them for their beautiful backdrops, their simple stories, and, often, their colorful music. Adults enjoy them as well, and for much the same reason. And no company has produced more beloved animated features than Disney. From Snow White to Aladdin, from Robin Hood to Tarzan, Disney keeps the hits coming. And yet, not until The Lion King did they produce a film that was not only loved as an animated movie but also became a Hollywood blockbuster, grossing more money than any other animated film of the 20th century. It truly is the king of all Disney pictures. The story of this wonderful animated musical is as classic as the film itself would eventually become; a outcast prince must return home to take his rightful place and protect his people. However, they are not people, but lions. Simba, son of the great lion king Mufasa, knows that someday he will be king. But his evil uncle, Scar, has other plans. Together with his gang of laughing hyenas, Scar plots to take the throne. 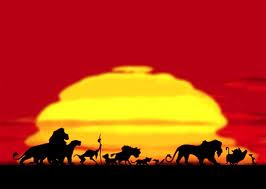 Simba must accept who he is and join the circle of life if he is to take his rightful place among the great lion kings. As with most animated films, the plot seems a little silly at first; lions fighting each other to become king. But as the story unfolds, and as the music begins, the film doesn’t seem silly at all. Wonderful and hilarious characters are introduced throughout the film, created legendary moments and movie-lines that will be repeated for a hundred years. And the music is beyond great. Songs like “Circle of Life”, “Be Prepared”, “Hakuna Matata”, and “Can You Feel the Love Tonight” are both catchy and original, leaving audiences humming tunes that they will never forget. An excellent story paired with phenomenal music, Disney strikes cinematic gold. As good as it was, it was still an animated film. The cast could only do so much with the dialogue, and it’s always strange when a character has two different voices, one for lines and one for music. But The Lion King is a spectacle that has no rival, a film that goes beyond animation into the realm of moving art. Give your inner child a gift and watch this film. Apparently, we are supposed to pretend that Anna Paquin (X-men, True Blood) is in high school. She’s twenty-nine. We are also supposed to pretend that she’s a good actress and can carry an entire film, keeping up with two co-stars that are around ninety times more talented that her. I don’t think so. Most people can spot movies that they’re not going to like. If you don’t like action movies you steer clear of explosions, car chases, and Jason Statham. If you don’t like foreign films you avoid subtitles. It seems simple to not watch what you would consider to be a bad movie. And yet, Hollywood is smart. They will trick you. They will advertise cleverly, cast daringly, and deny, deny, deny that their movie is what you do not want it to be. And this is how I watched Love and Other Drugs, a rom-com bomb that I should have seen coming. In this slightly edgy romantic comedy, love grows is unexpected places and against all odds. Jake Gyllenhaal (Brokeback Mountain, Jarhead) is a young pharmaceutical sales rep who is just entering the game. Desired by women and gifted with charm, nothing can stand in his way. That is, however, until he meets a young woman, Anne Hathaway (Brokeback Mountain, Ella Enchanted), who is not so easily convinced. While they both have inner demons that they must battle, love begins to grow and barriers start to crumble as love attempts to conquer all. Rom-coms are all the same; I’m not sure why I ever tried to tell myself otherwise. I was tricked by the beautiful people and the promise of something different; an edge that would take this film beyond the normal sappy drivel. But it was a lie. The plot seems developed from a formula that may have worked a thousand times but that has never created a film worth watching. And the advertised “edge” was darkly interesting, but it was just a diversion from the crappy lines, the emotional emptiness, and Hathaway’s knack for making every scene feel like high school drama class. While it wasn’t all bad, it wasn’t good enough. There were a few funny moments and I enjoyed the first half hour. But at some point I realized that the film was getting progressively worse. Attempts to raise it above the normal banality were almost sad. I wanted to give them some credit for trying, but then I remembered how I had been tricked into watching crap, and I didn’t feel as forgiving. Don’t be fooled; Love and Other Drugs is just a romantic comedy. It’s nothing better or worse, but it’s also nothing you should watch. How strange. Not only did July write and direct this odd film, but she also starred in it and supplied the voice for Paw-Paw the cat. If you have seen the only other feature length film that she directed, Me and You and Everyone We Know, you’ll be prepared for both cute quirkiness and some very disturbing behavior. Strange indeed. Before he sold out, Christopher Nolan was much stranger. At least, his films were. While Inception, The Dark Knight, The Prestige, and Batman Begins are all dark and interesting, his early films were weird and uninhibited in a way that Hollywood could not allow. You may remember Memento, which was odd yet popular, with it’s twisted storyline and editing. 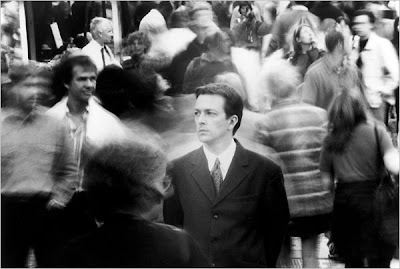 But two years earlier, Nolan directed Following, a prototype film in which he experiments with the style that would ultimately gain him fame, fortune, and, ironically, following. This black-and-white neo-noir film breaks all the rules of storytelling. The plot is cut into three sections which I like to call Scruffy, Shaven, and Shaven/Beaten Up. Then the three sections are scrambled up with one another in a seemingly random order, allowing the audience to often see what happens before we know why it does. Eventually, the story is pieced together and the climax is revealed as we watch a young British man naively enter into the criminal underground and immediately get in above his head. With only one character having an actual name, this whirlwind of a film leaves you both guessing and waving the white flag of surrender. While Following might be both confusing and darkly odd, it’s enjoyable thanks to, not in spite of, those things. The plot does not make any sense until the end of the film, but at only one hour long, it doesn’t take forever to figure out. Once the twists are figured out and the points are revealed I was left thinking, “Oh …cool,” but not much else. This film won’t blow anyone away, but it deserves credit for being an original creation and for being a stepping stone toward a much better film, Memento. Some films feel like good shorts but drag on too long, making them bad features. This film was a fleshed out short that stayed crisp while developing an intricate plot. It may not fit into any category, but it was still a clean and well-made picture. Nolan is much more than exploding bat-mobiles, and he proves it with his early works; check them out.